ALUMNI -- you'll get a great big WELCOME HOME and have many ways in which you can connect with old friends...and make some new Panther Pals! PARENTS and FAMILIES -- what a great time to see your Chapman Student and make sure that he/she has settled into to the new school year well! No matter your connection...Chapman Family Homecoming Celebration is a GREAT TIME to be a PANTHER! We're busy working on the 2019 event, here's what happened at the 2018 Chapman Family Homecoming Celebration. First time to campus? Haven't been back in a while? Please use the resources below to guide your way around our beautiful campus. Visitor parking information » Parking in Visitor Lots is FREE Friday, October 12 and Saturday, October 13; no permits are required while you are here for Chapman Family Homecoming Celebration. Coming in from out of town? We’ve got you covered. 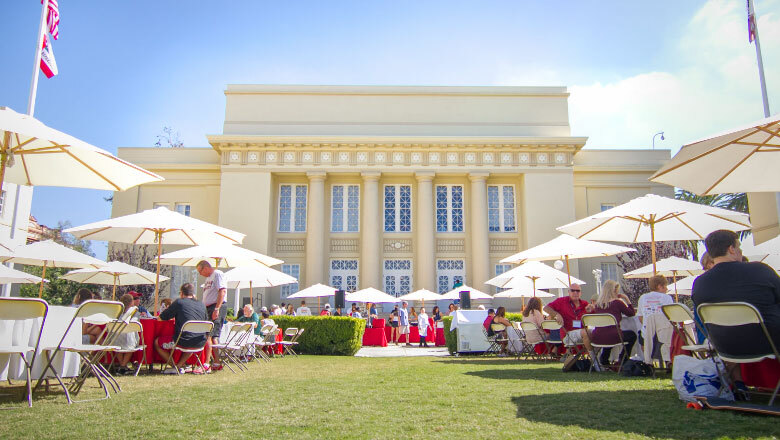 Chapman University is just steps away from the Orange Plaza Historic District and minutes from many world class hotspots for dining and entertainment. Show your Panther Pride and cheer on the football team to victory in the big game! All members of the Chapman Family (alumni, students, faculty, staff, families and friends) are invited to come together for a fun and relaxing afternoon on Bert C. Williams Mall. Enjoy delicious picnic fare and challenge your friends to games of corn hole, life–size croquet and other lawn games. Head back into the classroom and enjoy master classes taught by your favorite professors. It takes an army of volunteers to put on this fun-filled event! Would you like to join us? We would certainly appreciate your help! Stay tuned for a way to sign-up! Hello "First Year of the Baby Boomers!" Please join us as we celebrate our 50-Year Reunion and formally get inducted at the 50-Year Club Luncheon. For more detailed information and FAQs click here. Click here to help Student Scholarships through the Chapman Fund in honor of the Class of 1968!